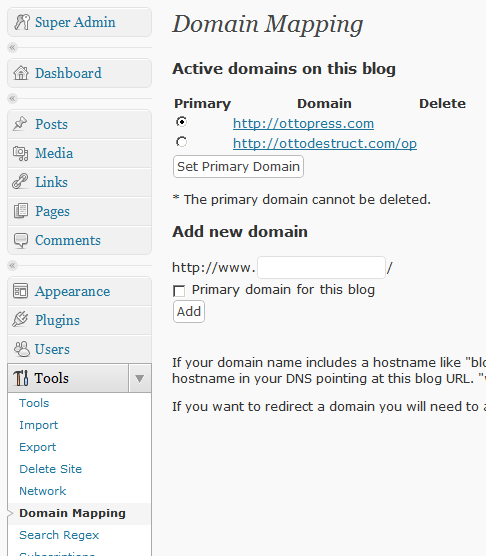 The other day, Klint Finley wrote a very good walkthrough of using the new Multisite functionality of WordPress 3.0. In the comments, a lot of people wanted to know how to use your own domain names. Since I’m doing that now, here’s a quick walkthrough/how-to guide. The Domain Mapping plugin is not your regular kind of plugin. You cannot install it through the normal Plugins->Add New menu. Well, actually, you can, it just won’t work. So first, download the plugin manually. The plugin has two main files you need to put in the proper places. The first file is the domain_mapping.php file. This needs to go into the mu-plugins folder. 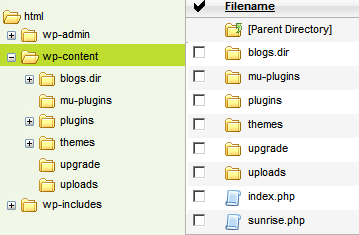 The mu-plugins folder is a special folder, which you may not even have yet. Just create it underneath the wp-content folder and put that file into it. The second file is the sunrise.php file. This is a special filename for WordPress. Don’t worry about it, just put it in the wp-content folder. Simple, really. 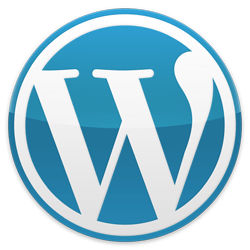 This will cause WordPress to go load that sunrise.php file and use it. Now you have to configure the domain mapping plugin so that it knows what it’s doing properly. This is easy to do, really. Go to your main domain’s admin page and log in as a super admin. 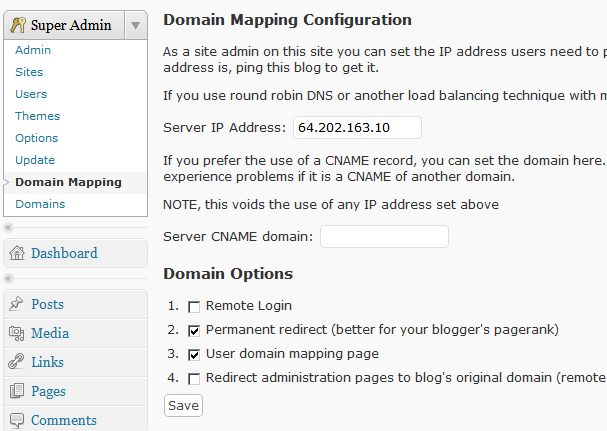 Then go to the new Super Admin->Domain Mapping menu. Here you have a few different options, but two main ones that count. You can either put in the IP address of your server (as defined in your domain’s main A record) or you can put in a CNAME that points to your server. The IP address is what most people will want to use. If your server uses more than one, you can enter them all here, separated by commas. Remote Login – This will make your login pages for all sites redirect to your main site to do the actual login. The benefit of this is that when you log in to one, you log into all of them. The downside is that the URL changes to another domain in order to log in. Permanent redirect (better for your blogger’s pagerank) – This makes your subdomain or subdirectory sites redirect to their domains. You should leave this on. User domain mapping page – Turn this on if you want users to be able to put in their own domains for mapping. Redirect administration pages to blog’s original domain (remote login disabled if redirect disabled) – This makes all admin pages show up on the original domain instead of on the new domains. You need this enabled for remote login to work. Generally I leave only the middle two on. Remote-login is iffy at best, and I want my new domain name to show up everywhere. There’s a bit of a prerequisite here before you do this. When you buy a new domain, you will need to edit its DNS settings to actually point to your server IP or CNAME or whatever you do to make the domain connect to your server. For me, I just give it a new A record with my server IP in it. Easy. Update: Okay, so there may be more to it than just that, depending on your host. Every host is different, and you’ll have to talk to your host to make them able to point the domain name at your existing site. How to do this varies from host to host, but the important thing is that when you visit your new domain (before you do this!) then you want it to go to your main site, as is. There’s two ways you can actually map a domain to one of your sites. 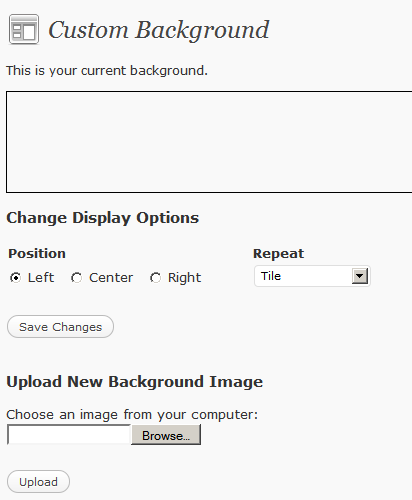 The user screen is the simplest way, if you left that option on before. Log into the site you actually want to map to a new domain, then go to Tools->Domain Mapping. All you really do is put in a new domain and set it as the primary. Simple. Note that if you didn’t get the domain pointed at your server before doing this, then your site will instantly vanish from the realm of mortal man. Setting the primary domain takes effect instantly. You won’t be able to access the site through the old domain any more. The other way to set domain mapping is through the Super Admin->Domains menu. Here you’ll find a list of sites and their ID numbers. You can map an id number directly to a domain name here. The Tools approach is a bit easier to use, but this will allow you to map domains without visiting them, as you can access this list from your main domain. You can also correct broken domain mappings from here. You’ll note that on the right hand side you can see the column showing the mapped domains. Special Note: See in the picture how I’m using a subdirectory install? That’s relatively new. In older versions of the domain mapping system, you had to use a subdomain installation and wildcard DNS for domain mapping to work. This is no longer the case, domain mapping works just fine with subdirectories. And that’s how it’s done. It’s not super complex, but it does require some knowledge of DNS and how servers work. If you can successfully set up a multi-site install to begin with, you can probably do this as well. Just be aware that it is slightly finicky, and know that you will break your site if you put in the wrong settings somewhere. However, your main domain will always be accessible as long as you don’t try to map it, so you’ll be able to go in from there to correct your mistakes. I’m switching all my sites over to a single 3.0 installation, with the new MultiSite capabilities. So the sites might be fruity for a while. In the process, I also expect to lose some things, such as the email subscriptions. Sorry about that, I’ll restore stuff like that later.